Check out Patrick's report from the Kansas City Paranormal Conference 2016, with interviews from 2 Guys in the Know, David Glidden, Brandon Callahan, Dusk 2 Dawn Paranormal, Josh Heard, and Frank J. Bennett. Plus, The Bells of St. Michael's. Visit BigSeance.com for show notes. Marla Martenson, a professional matchmaker, embarked on a spiritual journey to enlightenment, and it all started with a Buddha statue. Plus, have you ever been beaten by bamboo? (On purpose?!) Marla has! Plenty of Ouija discussion in this episode as well. Visit BigSeance.com for more info. 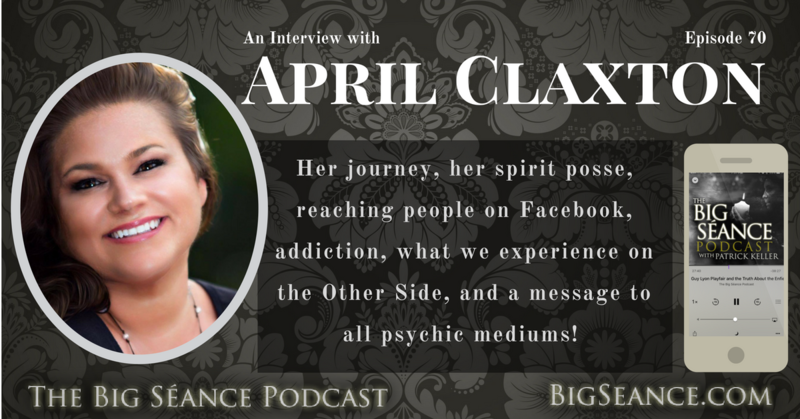 April Claxton is not your typical psychic medium. Learn about her journey, her spirit posse, reaching people on Facebook, addiction, what we experience on the Other Side, and a message to all psychic mediums! Visit BigSeance.com for more info.